Found in the heart of Bray, Co. Wicklow, the modern 3-star Royal Hotel and Merrill Leisure Club is just a few minutes’ walk from the Bray DART station. Enjoy a warm welcome and live music in McGettigan’s Bar and unwind in the on-site leisure facilities, which include a state-of-the-art-gym, Jacuzzi, sauna and pool. Rooms at the Royal Hotel and Merrill Leisure Club and Spa are furnished in a classic style, with satellite TV, tea and coffee facilities and safety deposit boxes coming as standard. Pay and Display Car parking is subject on availability, at a reduced rate of €5.00 for an overnight parking in the Dargle Car Park, located at the rear of the hotel. 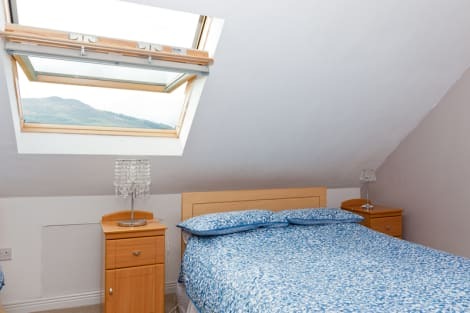 Located in Bray, Esplanade Hotel Bray is by the sea, a 3-minute drive from Bray Beach and 6 minutes from Bray Golf Club. This beach hotel is 5.8 mi (9.3 km) from Powerscourt Estate and 7.7 mi (12.4 km) from Wicklow Mountains National Park. Make yourself at home in one of the 103 guestrooms. Complimentary wireless Internet access is available to keep you connected. Bathrooms have shower/tub combinations and hair dryers. Conveniences include phones, as well as safes and desks. Hillview is a family-run B&B which offers good value accommodation, a friendly atmosphere and is conveniently located on the outskirts of Bray, County Wicklow. The house sits on 1.5 acres of beautiful land and provides great views over the surrounding countryside. All rooms are clean and comfortable with en-suite facilities. Guests can enjoy a tasty breakfast from the extensive menu which is served in the bright country style dining room. Bray is a pretty seaside town in County Wicklow, on Ireland's east coast. With its close proximity to Dublin, Bray is a popular destination for day trippers from the capital. They come for the ancient intrigue and gorgeous beach, and stay for the town's fun-loving nature and many attractions. The thing that first strikes you about Bray is the rugged beauty of its windswept beach. Made up of pebbles and sand, it is bustling with life during the summer and the perfect place to spend the day. However, if you are visiting a Bray hotel in the winter, take a dip in the salty Irish Sea for a truly invigorating experience. Bray's promenade is a delightful place for a stroll with an ice cream, from one of the many vans parked along the road. If you're up for a bit more of a hike, the Bray to Greystones cliff walk is a real treat, and you don't even need to leave town to find it. Just follow the promenade up to Bray Head to begin your adventure. The Cliff Walk is about five miles long and is not too rigorous at all. The walk follows the coastline and boasts some of the most breathtaking views of Ireland's east coast. The walk finishes in Greystones harbour, where the Marina has a number of great restaurants and bars where you can regain your strength. There are also some excellent shops and boutiques, if you're after a bit of retail therapy. After you've seen all that above land has to offer, pay a visit to the National Sea Life Centre on Bray's seafront. The Aquarium is completely indoors and so makes an excellent outing for a rainy day, though the kids will enjoy it whatever the weather. Its tanks are home to over 1,000 sea creatures including reef sharks, octopus, seahorses and piranha. If you're after a different kind of liquid activity, Bray's got some great pubs, perfect for whiling away the hours. The Porterhouse Bray on the seafront has got great brew and pretty good food as well. A bit further into town is Holland's of Bray, a local wine bar that also serves up piping hot bowls of delicious chowder and whose motto is, ‘If you can drink it then we will sell it'. All in all, Bray offers much more than your average seaside holiday. Its got charm and beauty in abundance.